Originating from the 11th century, the Sakya Lineage has been closely tied with the Khon Family since early times. The Khon Family is also known as one of the “holy families” of Tibet. 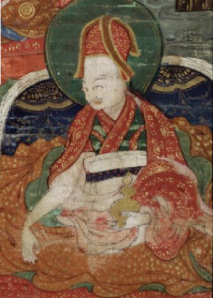 One of the Khon family members, Khon Lui Wangpo Sungwa, became a disciple of the great Indian saint Padmasambhava (Guru Rinpoche) in the 8th century. He was amongst the first seven monks to be ordained in Tibet. It was Khon Konchok Gyalpo who built a Sakya monastery in 1073, and thereby established the foundations of the Sakya Tradition in Tibet. Since that time, the Sakya’s unbroken lineage has descended within the Khon family. The Sakya tradition is one of the four major schools of Tibetan Buddhism. The head of the Sakya lineage in Tibetan is called, “Sakya Trizin”. Its direct translation means the “Sakya Throne Holder”. In keeping with tradition, the Sakya throne is passed down from father to son in the Khon family. History shows that the propitiation of Dorje Shugden was first practised by the Sakyas. According to some accounts, Dorje Shugden was inducted into the pantheon of Sakya protectors by Sakya Trizin Sonam Rinchen (1705-1741). Later, Sonam Rinchen placed Dorje Shugden together with two other Protectors: Setrab and Tsi’u Marpo. Collectively, they were known as the “Three Kings” (Gyalpo Sum). However in the early 20th century, Dorje Shugden Tanag fell out of favour with the Sakya Tradition in general. Subsequently, his devotees and practices diminished. From the late 20th century onwards, the offering rituals for the “Three Kings” were no longer found in the standard daily use of the Sakya Protectors’ texts in monasteries of India or Tibet. There are also several short liturgical works on Dorje Shugden written approximately 200 years ago by the Sakyas. This collection of works is known as the Dorje Shugden Be’u Bum. In one part of the Sakya ritual, Requesting to Annihilate Interfering Forces, the name Dorje Shugden was mentioned. As mentioned earlier, Sonam Rinchen is said to have composed this ritual. In the biography of his son, Kunga Lodro, the 31st Sakya Throne Holder, Kunga Lodro asserted that the ritual was written by his father. He added that he received the tranmission of the ritual from his father. It is said that the ritual is performed during the Secret Hayagriva puja. Although it was Sonam Rinchen who brought the worship of Dorje Shugden Riding a Black Horse to the Sakya community and made it well accepted, it was Kunga Lodro who completely embraced Dorje Shugden’s various other forms and rituals. Apart from receiving all the transmissions and initiations (such as Lamdre) from Sonam Rinchen, Kunga Lodro also received all the lineage practices from Morchen Kunga Lhundrub, who was the heart disciple of Nesar Dorje Chang. In his biography, Kunga Lodro wrote that Nesar Dorje Chang has written several writings on Dorje Shugden. As such, Kunga Lodro was well aware of Morchen’s practice of Dorje Shugden. It is stipulated that it was Kunga Lodro himself who successfully combined the five forms of Dorje Shugden with the main figure called, Duldzin or Vinayadhara. In the Rubin Museum of Art, there is a particular art piece that gives a clear explanation of the five lineages of Dorje Shugden, based on the depiction in a Sakya thangka from the 19th Century. In the thangka, there is an image of the grandson of Sachen Kunga Lodro, the 33rd Throne Holder (1792-1853). It is said that this thangka could have been painted during his reign. Dorje Shugden is the central figure in the thangka. He is depicted as sitting on a lion throne, holding a vajra club and lasso. The four cardinal emanations are also represented in the thangka. They are the Great Peaceful King (Shizey Gyelchen), the Great Increasing King (Gyenzey Gyelchen), the Great Powerful King (Wangzey Gyelchen) and the Great Wrathful King (Trakzey Gyelchen). 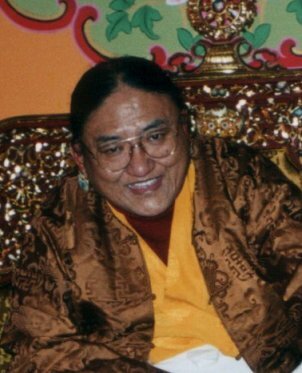 Kunga Lodro’s biography provides a clear perspective of the Sakyas’ practice of Dorje Shugden at that time. The Dorje Shugden Protector practice was prevalent and accepted by the various Tibetan schools in the early 19th century. This reinforces the premise presented by Stan Mumford in his book, Himalayan Dialogue that Dorje Shugden was commonly practiced at that time. Mumford related a story told by a villager of Shamey. It showed a striking similarity to the history of Dorje Shugden as shared by Kunga Lodro in his biography. Although there were some differences in Mumford’s account, the essence of the stories remained the same. Mumford further recounted that people in Gyasumdo, a village that followed the Nyingma tradition, also propitiated Dorje Shugden. During that time, it was common to find that in every Tibetan household, the image of Guru Rinpoche was placed together with the Protector Dorje Shugden on their altars. In fact, many household heads said that their altars were primarily set up to propitiate the Protector’s practice. Those who held strong faith in the relationship between Guru Rinpoche and Dorje Shugden would religiously make daily offerings. It is also said that each family owned a Dorje Shugden text written by a lama of their family’s tradition. Here, we can see that Dorje Shugden was not only practised by high lamas in monasteries. Mumford’s findings show very clearly that Dorje Shugden was also propitiated as a family protector amongst lay people. In fact, Dorje Shugden practice was so common that HIS practice became a crucial part of the daily lives, and not only specific to their religious traditions. As such, it can be said that while Dorje Shugden was first practised by the Sakyas, this practice was in fact embraced and practised by a wide segment of the community, and even by the different schools of Tibetan Buddhism. Dorje Shugden has been accepted by the Sakyas, Nyingmas and the Gelugpas from as early as the 1800s. It is perfectly logical that Dorje Shugden, being an enlightened being, is impartial and would be a Dharma Protector for all who propitiate him. This entry was posted on Saturday, November 26th, 2011 at 8:05 am	and is filed under Articles. You can follow any responses to this entry through the RSS 2.0 feed. You can leave a response, or trackback from your own site. It is clear that Dorje Shugden is in fact a enlightened protector from this, as many lamas would write texts about Dorje Shugden. With the fact that Dorje Shugden is placed on the same alter as Guru Rinpoche, it shows that Dore Shugden is definitely a Buddha. Why would someone place a unenlightened being on the same level as enlightened beings? It is just plain disrespectful towards the Buddhas. Hence, Dorje Shugden is in fact a enlightened being.